Roll fast, grip well and last a long time. That’s the three-headed dog that tire designers wrestle with in formulating tire compounding. It used to be that you had to sacrifice in one area to gain in another, i.e. tires that gripped well generally wore out quickly. 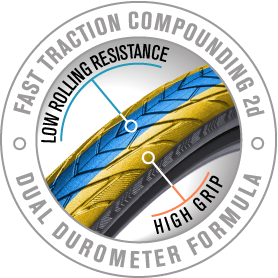 But with the ability to apply rubbers of differing durometers (a measure of hardness) and characteristics it’s possible to create custom rubber compounds that roll fast, grip well and have excellent durability. We call our custom compounding Fast Traction and we worked closely with riders of every discipline in multiple regions to find compounds and tread patterns that excel in their given category. Whether it’s an urban commutes, gravel paths or dirt roads, there’s a Fast Traction option to match where and how you ride. Fast Traction 2d U utilizes a harder durometer center section than 2d XC for improved durability and puncture resistance while maintaining the softer durometer shoulder section for predictable handling. Handling performance is balanced with preferable wear characteristics.